← New Biker Babe Tours Web Site: Check it! Haaaaaa! Finally! 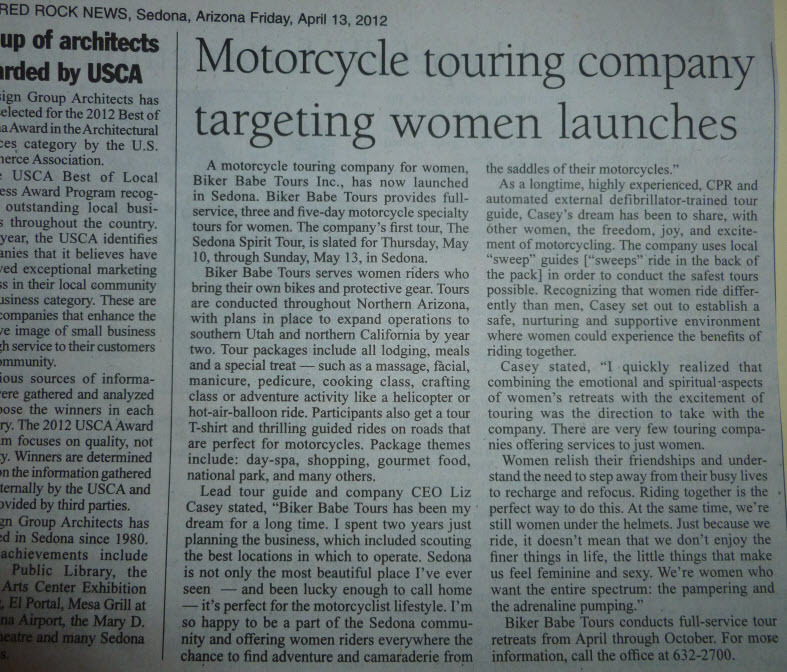 Biker Babe Tours gets some press. Thank you, Sedona Red Rock News! After sending out dozens of press releases all over CA, AZ, and NV, we finally got some press. Here’s a photo of the release that I wrote. They printed it verbatim (other than spelling out the acronyms). This entry was posted in Female Motorcyclists, Motorcycle Touring Company and tagged biker babe, News about women motorcyclists, red rock news, sedona red rock news, travel, vacation. Bookmark the permalink.